Prince 570 open (2018) is a great speedboat, boat of the year. Boat has 140hp strong NEW Suzuki fourstroke engine and and best fuel efficiency on market so you will be able to reach desired destination in a short time and save money on fuel. With full pack of extras making this boat EXCLUSIVE. Some equipment: Shower, GPS, Sonar, Lights, Digital tacho with fuel consumption and trip computer, Bimini, dining table, radio, usb, mobile charger. It can take up to 6 people and it is really comfortable and spacious. Perfect for all day sunbathing and relaxing! If you want to visit beautiful Croatian coast, islands, famous beaches we can offer you something that you will remember. 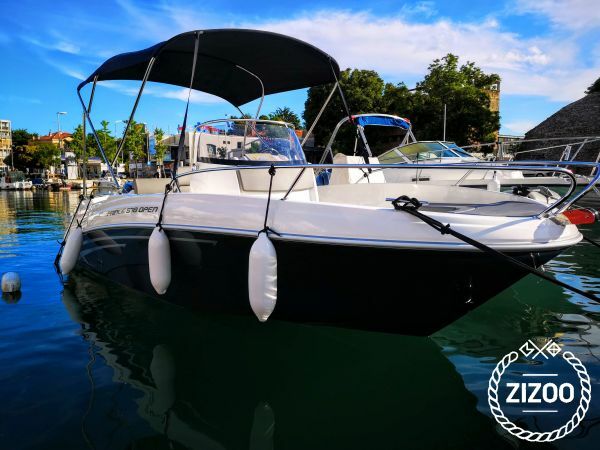 We offering brand new boat with full equipment, it is perfect way to show how is beautiful Croatian coast and islands to your family on your vacation. Explore the islands and archipelagos of coastal Croatia. Hop into your speedboat in Zadar and zoom out onto the Adriatic Sea with your guide. Visit beautiful Kornati National park, Pašman, Ugljan, Iž, Sestrunj, explore the pretty fishing village of Sali on Dugi Otok Island and discover top local attractions such as the famous cave on Dugi Otok, swim or sunbathe at your leisure in unique bays and discover rich heritage. Enjoy the crystal clear sea and beautiful landscape and untouched nature. This the RIGHT CHOICE for you. The boat is ideal for groups(6 people) or families with KIDS. Boat is located in beautiful city of Zadar. It will be our pleasure to rent you an EXCELLENT motor boat and provide you all the instructions and suggestions of amazing locations so you can start the sea adventure of a LIFETIME!! !